Seriously. I'll be honest, we weren't sure what to expect! It was the last day of the Lemon Festival and I was quite excited, although traffic was horrendous. The autoroute there was fine, but as soon as you exited at the Menton exit, you joined a slow-moving, long queue for several miles. Menton Lemon Festival- worth a visit? Menton is on the south-east corner of France, about 10 miles from the Italian border, right on the coast. It's a beautiful part of the world- definitely worth a road trip. Menton is also only an hour from Nice, so you can easily visit for the day. There's also a festival in Nice at the same time- check out the timetables so you can catch both. Luckily we were on the bikes, so we decided to park up and walk the mile or so into Menton. It was quite easy to find motorbike parking, but I think cars would be much harder as you are directed into designated car parks. Motorhomes are apparently parked in a carpark on the seafront, but only on Sundays!? I'm really not sure why or what happens on the other days! You are not allowed to take dogs into the garden or even for them to be on the parade apparently. There are too many people and the organisers don't want dogs fouling in the garden, which I completely understand. We didn't want to leave Mac in the motorhome all day, so Mr WB volunteered to sit in a cafe whilst I visited the festival, then he could go in afterwards if he wanted to. I really don't know what I expected, but I naively hadn't expected SO.MANY.PEOPLE. Oh my goodness, it was crazy! Once we had the tickets, we had to join the queue for the actual entrance. I think we were queuing for about an hour- it was very slow moving as they checked everyone's bags and patted people down. Not sure they appreciated my biker girl kevlar! Once inside, it was just a mass of people. I managed to get close to the displays (there were 10 in total- the designs change every year) by standing my ground- luckily I'm tall! People were trying to push you out of the way and walking in front of you whilst you tried to take photos. There was a huge mix of nationalities, including a surprising number of Chinese/ Asian. The displays were impressive- I cannot comprehend how long they must take to build! All the lemons and oranges looked fresh too- even though this was the last day! I have no idea how they managed to do that. Fun Fact- did you know when you plant a lemon tree that you can't tell if it's going to be a lemon or an orange tree until the fruit grows! There were lots of stalls inside the garden and lots of vendors shouting their wares. You could buy lemon trees (I was so tempted, but we were on motorbikes! ), lemon juice and limoncello, lemon soap, postcards, photos and many other mementoes. There were also some food/ drinks stands, but as I was on my own I tried to be as quick as possible. Wear comfortable shoes. There are very few places to sit down and it's so busy you're unlikely to get one anyway. It's a surprising amount of walking. Having said that- an extendable tripod or selfie stick you can carry above your head with a go-pro or something on it might be a really good idea so you can see over people's heads. Bring a bottle of water in with you, especially if it's sunny. The garden acts like a bowl, and all the heat from all the people makes it quite stifling. Unless you REALLY want it, you can find much cheaper postcards and souvenirs outside the garden at other shops around Menton. Tourist shops are open on a Sunday during the festival. Menton itself looks like a really pretty town- we'd like to come back and see it better. Much of it is closed off during the festival, so we'll have to revisit at a different time of year to explore it properly. We'd also like more time to explore the rest of the French coastline, including Nice, which has lots of cheap and free things to do– surprising for the French Riviera! 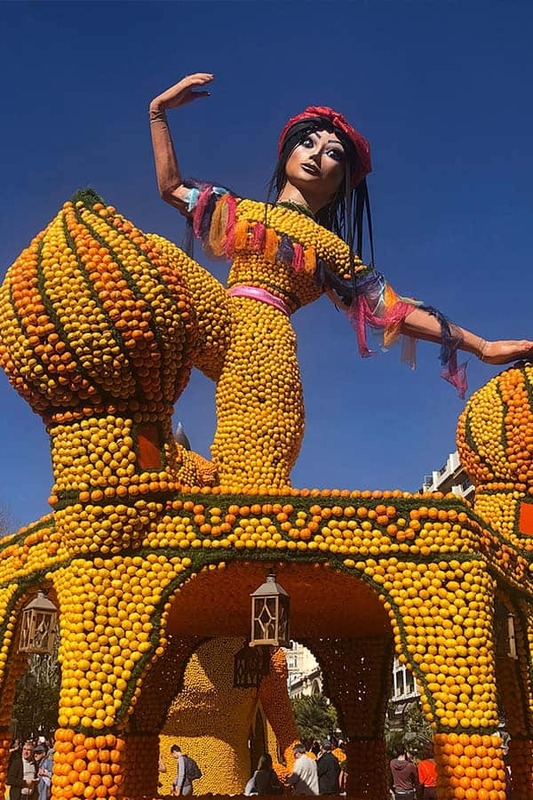 Have you ever visited the Menton Lemon Festival? Would you like to? Let me know below.